John Dailey Software : Something different. Find answers to technical questions. Need an answer to a non-technical question? Run a dialup or internet Bulletin Board System? Looking for unique games and utilities? This is the place to find cool shareware and freeware software to enhance your BBS experience or enjoy on your own. A recent server move resulted in some of the download links reporting as not found, which has been resolved. Due to the overwhelming amount of SPAM that I have been receiving, I've been forced to change my primary email address. Please use the contact form here on the site to initiate contact with me should you need to. Dungeon Master Construction Set registrations are now available free of charge! If you caught the April 28th or June 3rd epsiodes of G4TV's Attack of the Show, you may have seen that the crew there have setup a retro-style, dial-up only BBS running WWIV. We were honored to donate a full set of registrations for their system. You can give the BBS a call yourself at 1-310-979-2699 if you still have an old-school terminal app handy. For those of you who missed the shows, I've also put both segments up here on the site for your viewing enjoyment. Not receiving registration codes or replies to email? We're having a significant problem with our outgoing mail being bounced back to us as undeliverable due to blocklists and other anti-spam techniques. PLEASE make sure that you add @johndaileysoftware.com to your whitelist so that you can receive our e-mail. If you have not received a registration code or reply to an e-mail, please send it again from a location that can accept e-mail from us. Thank you! Global War v2.7 now available! This release is a minor update (and free upgrade to registered users) to v2.6 which fixes the problem with players unable to take their turns and enhances both local and remote display of the map images. WARNING: If you are running v3.0 IBBS, DO NOT apply this upgrade as it will corrupt your data files. This update is for v2.6 (or previous) users only. Hackin' Crackin' v2.0 Win32bit is currently undergoing beta testing. This version of the software represents months of work of porting our existing library files and the door's code itself to work as a native 32bit Windows application. 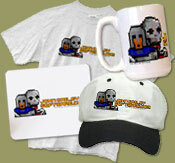 Get your John Dailey Software t-shirt, baseball cap, mug and mouse-pad! Show your love for BBSing and our products like Barren Realms Elite with a snazzy shirt, cap, mug or mousepad. Create a game module for Dungeon Master and you can receive a free registration for the game and construction set! See this FAQ for more information. Subscribe to our semi-annual newsletter. Encountering a runtime error when installing game modules? This tech note will help you out.